‘In a divorce only lawyers win’. It is commonly known that divorce legal fees are out of proportion. Why? Unlike, for example, in criminal cases, where it is good for lawyers to win, in divorce cases there is no such as win or lose. Divorce cases are therefore a ‘paradise’ for most lawyers. There is no incentive for lawyers to settle or solve matters quickly. ‘A task will take all the time you have’. A lawyer’s task will take all the time he can justify, often leading to taking all the money you have. As a sales person needs buyers for their products, lawyers need buyers for their services. Unlike products, which are generally fixed, services are fluid / elastic. 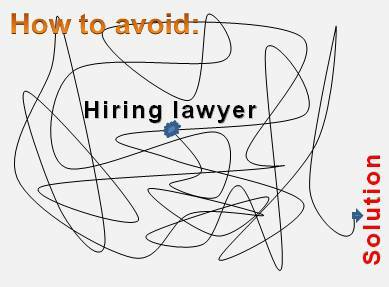 A task you give to a lawyer, will take the lawyer all the time he can justify, and justifying time spent on legal work is generally very easy. For individuals to know and manage the work lawyers do in their case – is generally a fiction. Length of consultation with us will be fixed from the start, so we have no incentive to delay, but only to help you solve your case with minimal costs. Lawyer cannot give price estimate – says it depends on how the dispute goes, including where parties agree. Lawyer charges for every single email, phone call, etc. Negotiations go in circles, repeating over and over. E.g. a recent client spent £50,000.00 and nothing has been solved yet. This cases is an ordinary case – very straightforward – but lawyers keep going back and forth and charging for every move.